Hungry? Like, really, really hungry? Then you need to visit the Tokyo noodle restaurant known as Ramen Shop, because if you can eat one of their huge bowls of ramen in a certain amount of time, your meal is free. If you fail the “jumbo ramen challenge,” then you’ll need to cough up 2,000 yen (US$19.23). That’s for approximately 1 kilogram (2.2 pounds) of noodles and 1.5 liters (1.58 quarts) of soup. To put things in context, bowl of ramen is usually around 800 yen ($7.70) and does not come with 1 kilo of noodles. Heh. It really is jumbo ramen. 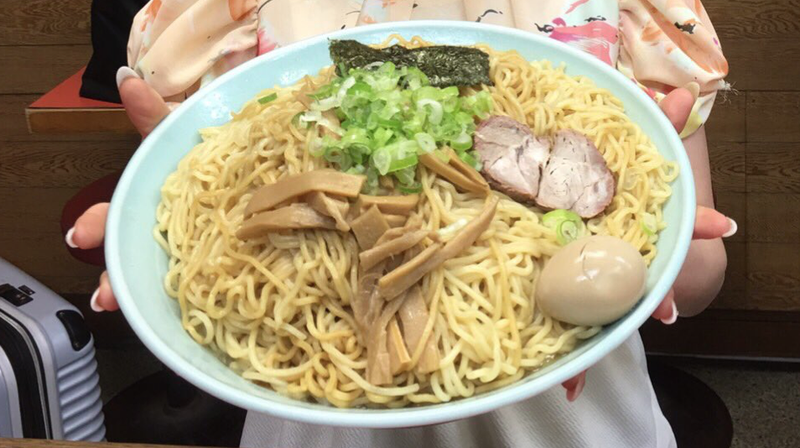 There is also an abura soba challenge in which you must eat around 3.2 kilograms of noodles in thirty minutes. That’s, uh, 7 pounds (seven!) of noodles. Failing to do so means 3,000 yen ($28.80), but if you are successful, it’s free! Via 2ch, let’s see some brave challengers. Dual chopsticks might be helpful. For most folks, I imagine the challenge would start like this. So, what are your odds? According to Ramen Shop, the rate of successful challengers in 2015 was 32 percent, but in 2014, it was 47.6 percent and 44.1 percent. Though, don’t get your hopes up just yet because in 2012 it was 34 percent and in 2011 it was 32.5 percent. Still, not impossible! If you can eat a lot (and I mean, a lot), then, by all means, perhaps give it a go the next time you are in Tokyo.